1982 Women's PPPA World Open . Aug. 21, 1992 . New York, N.Y.
We're suckers for underdogs: Tommy Kennedy in the 1991 U.S. Open at No. 27; Avelino Rico topping Raymond Ceulemans at No. 17; even this month, Shannon Daulton topping the Miz (see No. 9). But there is a certain place for the favorite, especially when she wins in style. 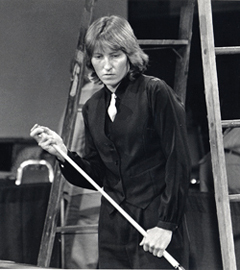 Jean Balukas was expected to beat 16-year-old Loree Jon Ogonowski in the final of the 1982 PPPA Women's World Open. She did so by running 55-and-out - a record for major women's events - in front of friends and family in her hometown of New York City. Working her way to the final, Balukas posted victories over Ela Eleholt, Belinda Campos and Vicki Frechen, twice. In the race-to-75 final, Balukas nursed a 20-19 lead when she stepped up to the table in the 20th inning. This time, the balls kept falling as her score kept climbing. All the while, Ogonowski (Jones, these days) suffered the slow death of a straight-pool player stuck in her chair. "I remember sitting there and thinking, 'I wonder if she's gonna miss. I wonder if she's gonna miss,'" Jones said. "And with each passing ball, the more she made, the more I thought that this isn't going to happen." Balukas eventually put the final nail in the coffin, making the 55th straight shot to capture her fifth world title with a 75-19 victory. "A race to 75 is a hop, skip and a jump," Balukas said. "Against a player like Loree Jon, you have to run balls or you blink and it can be over." Balukas left nothing to doubt by running 55 and out. The title was her first since returning from a yearlong sabbatical from pool. After not being allowed to compete against the men at the 1981 World Open, the 22-year-old Balukas stepped back from the game, opting to focus on college and volleyball and tennis and golf. "That was a special tournament, coming back and winning that one," Balukas said. Her reappearance on the pool circuit marked a return to the status quo between Balukas and her junior rival. Ogonowski would later notch a few big wins in the years to come, but in 1982 she had yet to break through against Balukas. At this time, any tournament Balukas entered was hers to win, and the rest of the field understood that it would take something special to upset her. "She had phenomenal presence," Jones said. "She was so determined to win, so focused, and had such an air of a champion. She had that around her, and that's what I tried to emulate." And although Loree Jon got a little bit of revenge at the 1984 World 9-Ball Championship (No. 13 on this list), the '82 World Open was of historical merit for Balukas. After the match, the balls and rack went to the Smithsonian Institute in Washington, D.C.
"I remember people would call me up and say they saw my little piece of history on display at the museum," she said. "And hearing that was really exciting to me."